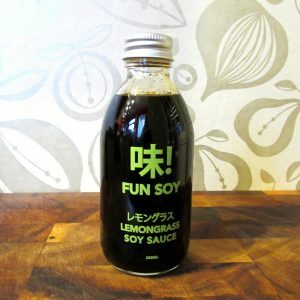 I first heard about Fun Soy soy sauce on Twitter and was really intrigued. I have to admit to being a bit blasé about soy sauce, often stingily substituting Japanese soy sauce or tamari for cheaper Chinese light and dark soy sauce, without really knowing what the difference was or how I was affecting the flavour. More recently I have gradually come to realise that in substituting soy sauces, I was leaving out a level of richness to Japanese dishes that the Chinese soy sauce lacks. So I have recently been stocking my ingredients cupboard with Japanese soy sauce. The flavour difference has been most noticeable in my ramen egg recipe, which now tastes even more amazing! This brings me nicely onto Fun Soy, a gourmet Japanese style soy sauce made in the UK, available in three flavours: truffle, lemongrass and chipotle. Fun Soy is exclusively available in Harvey Nichols food hall at the moment and from the Harvey Nichols website. I’m really hoping they will become more mainstream over time because I think with the increase in interest in Asian cuisine there is really a place for a more premium range of soy sauce. 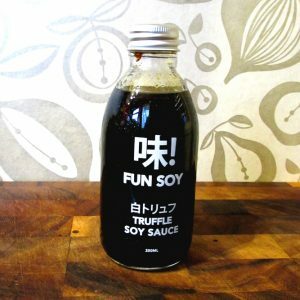 If you travel up to the food hall on a Saturday from now until Christmas, you will find a Fun Soy stall where you can try the different flavours before you buy. I bought all three so I could experiment and see what works in various dishes. The truffle flavour is the most subtle, so this for me is the soy sauce to use when you don’t want to add another flavour. I’m not sure what truffle tastes like and if I blind tested it, I don’t think I would know that it was flavoured, but it is a great tasting soy sauce which I have used in many Japanese dishes for an intense umami flavour. Try adding a tablespoon to my ramen egg recipe in place of one of the light soy sauce, for a richer, earthier flavour. For some reason I wrongly had it in my head that chipotle had a smoky flavour, probably because I am more used to using it in Mexican cooking. The chipotle chilli added to this soy sauce creates a slightly warming heat, more noticeable after eating than hitting you as soon as it’s in your mouth. This is great for a little chilli kick without blowing your head off. Try adding a dash to cashew nuts or pumpkin seeds before roasting for a tasty salty and slightly spicy snack. The lemongrass flavour was the one I was most uncertain about. Lemongrass flavours can be rather citrusy and I couldn’t see how it would work with a soy sauce. Also, as it’s more of a Thai flavour, I wasn’t sure how much I would use it, as I often make Thai curries when cooking Thai food, which doesn’t need soy sauce in. However, I have found that the tangy flavour of the lemongrass is great to add to a relatively bland stir fried vegetable, such as cabbage, to give it a subtle Thai flavour. Even better, combining it with Wild Island’s ginger and lemongrass chilli oil (or another lemongrass and chilli flavoured oil) intensifies this flavour and creates a great taste for a vegetable dish to accompany Thai curries or stir fried dishes. My only criticism of these sauces is that, despite loving the sleek glass bottle and graphic design, I really don’t like the plastic insert which only lets a tiny dribble out of the bottle. It can be quite annoying if you like to be quite liberal with your soy sauce as I do! It would also be nice to see the brand expand into gourmet snacks maybe, Fun Soy flavours crackers or nuts, maybe quality table or cooking sauces too. Just a thought! 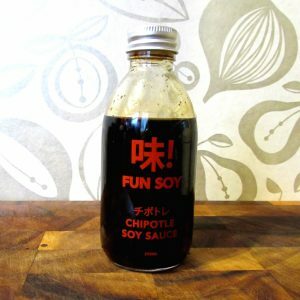 I am really enjoying cooking with these soy sauces and finding what dishes they work well in. I think my favourite is the chipotle for its spicy kick (which is probably noticeable as you can see I’ve used more than the other two! ), which works well in many recipes. At £6.99, they are definitely at the high end of the market, but they are well worth a try and as it’s that time of year, would make a fantastic stocking filler for a foodie who likes trying something new and different. 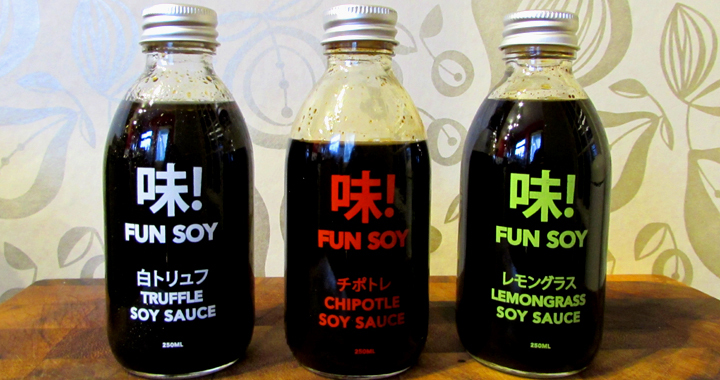 Posted in Reviews and tagged Chipotle, Fun Soy, Lemongrass, Review, Soy Sauce, Truffle.